‘Skiver’ – somebody who is temporarily too ill to work, and therefore in receipt of statutory sick pay. ‘Shirker’ – somebody who prefers to work in return for a salary, rather than in return for no salary. ‘Reform’ – (I) To terminate something. (II) To sell something. (III) To pay a private company to do something. ‘Independent Review’ – pamphlet written by a partisan hireling to reaffirm policies, and whitewash potential problems. ‘Consultation’ – seeking expedient approval. ‘Unreliable’ – inconvenient expert testimony. ‘An inconvenience’ – a person who has committed suicide. ‘Abusing the system’ – exercising rights. ‘Delivering change’ – encouraging people to protect their own interests at the expense of a scapegoated minority. ‘Making the welfare state fair to both the people who use it and the taxpayers who pay for it’ – making legislative protections more precarious. ‘Cultural transformation’ – creating new opportunities for delivering public finance to private companies. ‘Radical transformation’ – beginning to implement poorly-planned methods of delivering public finance to private companies. ‘Welfare savings’ – social security cuts. ‘Successful court outcome’ – a court case which has been lost by the government. ‘Stock’ – a human being. ‘The taxpayer’ – (I) HM Treasury. (II) A figment of political imagination, which functions as a touchstone to justify policies. (III) Somebody who begrudgingly contributes the bare minimum to society, and vociferates a vein of parsimonious condescension via the pages of tabloid publications; while simultaneously bemoaning others for lacking a sense of societal obligation or modesty. ‘Spiralled out of control’ – the level of social security expenditure has risen in tandem with the level of economic difficulty. ‘Lifestyle choice’ – an impoverishing set of circumstances beyond anybody’s control, such as severe illness, or providing full-time care to relatives. ‘Something for nothing culture’ – a social security system in which support is based on need, and receipt is subject to strict conditions. ‘Ending the Something for nothing culture’ – exploiting public miscomprehension about the benefit system in order to encourage resentment, and subsequently diminish aspects of the social security system, so that it no longer protects anybody from being left impoverished – whether those currently in need of its protections, or those who will require them in the future. ‘Claimant commitment’ – an onerous set of strictures designed to generate pitfalls, purposely designed to become breached unwittingly, resulting in sanctions. 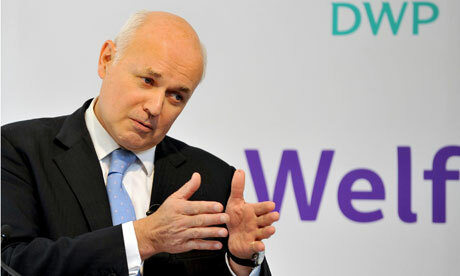 ‘Off benefits and into work’ – sanctioned. ‘Trapped on benefits’ – provided with a limited degree of financial support, on the basis of circumstantial need. ‘Making work pay’ – leaving pay rates unaffected, and reducing the level of unemployment support. ‘Capping benefits at a fair rate’ – eroding the financial resilience of the poorest families. ‘National Living Wage’ – a drastic reduction of the minimum wage for people aged 21-14; and a minor increase in the minimum wage for people aged 25 and over, but attached to a severe deduction of in-work benefits. ‘Simplifying the system of support’ – undermining the range of support available to people. ‘Targeting support to those who need it most’ – taking support away from people with complex, fluctuating disabilities. ‘Improving work incentives’ – pushing people who are unemployed into such a depth of poverty that even in-work poverty is a step-up. ‘Positive behavioural effects’ – encouraging people who are poor to regard social security with the same level of snobbery and disdain as wealthy people are liable to, until they support its dismantlement likewise.